Yesterday, I met with a young man at my local coffee hangout. A week before, he had overheard someone say I was an entrepreneurship professor and asked to meet me. I rarely turn down a request like that, so there we were, he with his Mountain Dew and me with my coffee. Within five minutes, it was clear that he had not asked to meet me to get advice, but to recruit me for a multi-level business–one you would recognize. (Pause for groans.) Having adjusted my schedule to accommodate him, I was not happy. But, he appeared to have a sincere desire to help himself and his family, so as he drew lines and circles on a legal pad, I ran through in my mind the ways I might help him. I told him bluntly that I was not interested in being a distributor, but that I could help him succeed if he were willing to listen. The first question I asked him was, “So, how well have you done in your first two months?” Turns out he had talked to “three or four” prospects, including me. Ouch. I realized that he was headed for some serious failure at that rate. Next I asked if he had another source of income. He did–a part-time minimum wage job. Ouch number two. At the rate he was going, poverty would remain a central part of his life for the foreseeable future. To top it all off, his presentation was worse than weak. No wonder no one had signed up. For the next thirty minutes, I showed him that in order to recruit the 75 people he needed to pay his bills, he would have to talk to at least 20 people a week, hoping to get one to sign up. I showed him that doing so would realistically require 15-20 hours of focused, difficult work. I don’t know whether the lesson really sank in, but I left thinking that I had at least introduced him to reality. The moral of the story? We often hear pitches about ways to supplement our income. Emotionally, that is intoxicating. Who among us has never asked whether what we make at work is going to be enough to survive in retirement or put a child through college? Who wouldn’t want more income? (Careful. People who say they don’t want any more money would lie about other things too.) The problem is that we stop there, with the idea of making more money. There are a host of good reasons to supplement your current income with a business. 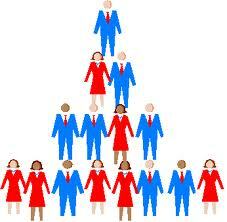 And multi-level marketing might just be your cup of tea. But please don’t kid yourself. No matter how many circles and lines they show you on paper, the only sales you make will come dearly. Do the math and then ask yourself, “Am I really committed to this?” If the answer is yes, give it your all. If the answer is maybe, save yourself the trouble.